The U.S. National Data Infrastructure (NSDI) is improving with broader expertise, according to an assessment by the Coalition of Geospatial Organizations (COGO). The NSDI’s grade rose from a C in the 2015 Report Card to a B- in the 2018 Report Card. The improved overall grades reflect a broadened base of experts and government organizations involved in the assessment, as well as an expanded set of assessment metrics, according to COGO. The report card uses a letter grading system to depict the status and condition of the nation’s geospatial infrastructure. The assessment measures NSDI’s ability to meet future geospatial data, based on address, cadastral, elevation, geodetic control, government units, hydrography, orthoimagery and transportation themes. Chart: COGO, from 2018 Report Card. establishing key partnerships within the geospatial field. COGO member organizations represent leaders in the geospatial field and collectively represent more than 170,000 individual members. Member organizations aim to engage Congress, federal agencies and the FGDC to maintain successful practices and develop improvements and solutions related to the NSDI. 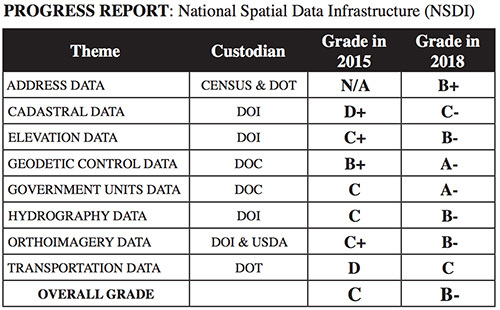 The full 2018 Report Card on the U.S. National Spatial Data Infrastructure, along with the COGO executive summary, video webinar, and presentation slides can be found on the COGO website.